A dead, pregnant whale which washed up on a Sardinian beach was found to have 22 kilograms [49 lbs] of plastic insides its stomach. 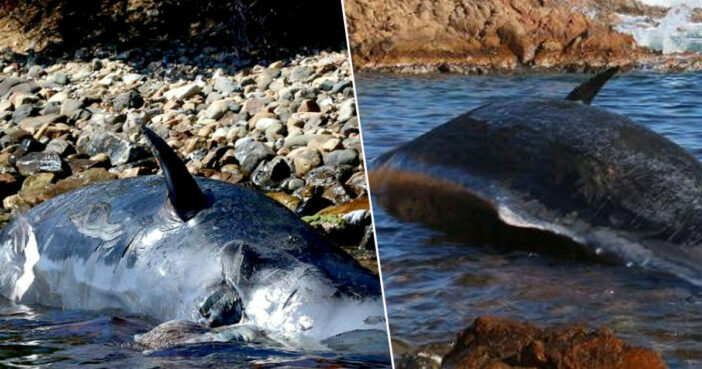 The sperm whale – which was eight metres [26 feet] in length – was discovered on the shoreline of a private beach resort in Cala Romantica, close to Porto Cervo. The young female whale was found to be malnourished, with the fetus in her womb having been dead for some time. The horrifying state of the animal’s stomach has again reopened the much needed conversation about the devastating impact of disposable plastics on the environment. Garbage bags … fishing nets, lines, tubes, the bag of a washing machine liquid still identifiable, with brand and barcode … and other objects no longer identifiable. The fetus was in an advanced state of composition. This sperm whale was found dead in Porto Cervo in Sardinia: in the belly it had a fetus and 22kg of plastic … Is there still someone who says that these are not important problems? For me, yes, and they are priorities. The marine litter (the litter of waste at sea) afflicts the whole marine world, not just Italy, of course, but every country in the world has the DUTY to apply the policies to contrast lo: not today never yesterday. We have used in a light-hearted way the ‘comfort’ of the disposable in these years and today we are paying the consequences, indeed they are paying above all the animals. The #SalvaMare bill that will arrive at the Council of Ministers in the coming days, will help these sea creatures because they will find much less plastic in the seas, thanks to the fishermen who can FINALLY bring all the plastic caught ashore (I remember that today they are practically OBLIGATORY by law to throw it back into the sea). From 2021 it will begin to PROHIBIT the use and trade of the plastic throw-away. The European directive that established it was approved and I promise you that Italy will be one of the first countries to implement and implement it. In addition, I invite ALL mayors to make and sign ordinances on the ban on disposable plastics in their cities and on the Italian waterfronts such as Capri and the mayor Luigi de Magistris in Naples. The war on disposable plastic has begun. And we won’t stop here. The cause of the whale’s death will be confirmed once histological and toxicological examinations are conducted on the body by veterinarians in Padua, northern Italy.